For this year&apos;s 24 Hours of Le Mans, we&apos;ll be seeing the Audi R8 act as the official safety car. Like the regular production model, the R8 Safety Car is powered by the same V10 with 525hp with a top speed of 197 mph. And yet, a car with this magnitude of power seems like it could actually compete in the 24 hour endurance race. 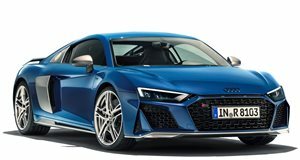 In the past, safety cars from Mercedes, Porsche, and BMW have been used, but only Audi and Porsche have had such success competing in the race itself. Also be sure to be on the lookout for the competition Audi R18 LMP1. Stay tuned for the 24 race taking place this weekend from June 11th-12th at the Circuit de la Sarthe, Le Mans, France.